While living in cottage country has a unique appeal, building there involves special challenges that urban and suburban builders will likely never have to deal with. Access is a common dilemma, especially when cottages are on an island and building materials need to get to such problematic sites. Some builders, like Kawarthas Lake Construction, deal with island builds by waiting for winter to ship materials across the ice by snowmobile or truck. As well as trucks, company president Scott Wootton keeps snowmobiles and ATVs among his equipment. The Shield presents more challenges than access, as Craig McFarlane of Linwood Homes can tell you. It’s often impossible to build basements or to install conventional septic systems. Old cottages weren’t subject to the same stringent setback rules that completely new builds are. So if owners want a new home as close to the water as the original cottage, it can take some design savvy to figure out how to fit a new cottage into an old footprint, as Larry French of French’s Fine Homes did recently. More than a steep hillside posed a challenge for French’s Fine Homes in building a new four-season cottage on Lake Vernon in the Huntsville area. The A-frame structure that had been on the site previously was destroyed by fire and the owners, who used it as their primary residence, were coping with shock and grief. As well, the new cottage had to be built on the old grid or would be subject to new rules requiring greater setback from the lake. Company president Larry French, sales and marketing director Al Bryant and selections coordinator Mair French (Larry’s sister) helped guide the couple as they came to grips with their sudden loss to create a new cottage that they would love. The new abode, with cedar cove siding and timber frame elements inside and out, fits well into its lakeside setting and has spectacular views. Larry French used the same footprint as the old cottage to design a 3,568-square-foot, three-storey residence with a new walkout basement (there wasn’t previously a basement). Because the bank is almost vertical, French’s carved into it as part of the new design. As construction got underway, Larry suggested adding a couple of dormers to give an even airier feel and to allow more light to pour into the space. As the company has in-house auto CAD, making such changes was relatively simple. As the homeowners got more involved in the process of the build, their grief lessened. At Mair’s suggestion, they added custom metal panels depicting loons, fish and bulrushes along the railing overlooking the main floor from above, and the wife created stained glass pieces to include in the house. A 2,262-square-foot cottage by Linwood Homes on Jack Lake near Apsley in North Kawartha is a prized possession—literally—as it was the early-bird prize offered in the 2014 Princess Margaret Cancer Centre Home Lottery. Designed by Linwood’s Craig McFarlane, the year-round cottage in Jack Lake Estates has three bedrooms and three bathrooms and sits on a 2.4-acre hilltop lot, 300 feet above the lake, offering spectacular views. All of Linwood’s wood construction materials come from B.C. and three types were used on the exterior: horizontal western red cedar V-joint comb-face horizontal siding, natural channel siding on gables and dormers, and darker-toned tongue and groove soffit and fascia. It includes a magnificent great room with an expanse of windows overlooking the lake that opens to the kitchen and dining room. A three-season screened porch and a lake-facing sun deck provide indoor-outdoor living. The second level features a loft and a large games room. The cottage’s well is 540 feet deep and the septic system is a high-performance Waterloo Biofilter system well suited to bedrock settings such as this one. Unlike conventional septic systems that use a tile bed to treat and dispose of waste, the Waterloo system uses an engineered synthetic, absorbent filter to treat sewage and process wastewater. Because of the bedrock, there is no basement. Since the cottage was a full post and beam construction, the entire interior could be opened up and vaulted ceilings installed—some of the beams are as long as 22 feet. A glass railing system was used in the loft to allow for unobstructed views of the woods and forest. This custom, 5,500-square-foot weekend family home belonging to Toronto HVAC engineer Andy Selin blends harmoniously with its rugged natural setting on a 10-acre private island off St. Joseph’s Island in the North Channel, while incorporating some leading-edge technologies. The custom-designed Normerica Timber Frame house boasts generous use of wood, natural stone and glass and every room has a view of the water. Selin wanted the house to be designed on “pattern language,” a term coined by architect Christopher Alexander in the 1970s to describe a structured method of design practices that ordinary people can use to solve simple to complex design problems. “Andy was really the leader of our team and we worked together with him, and the result was fantastic,” says Bill Williams of Normerica. He says access to the island wasn’t a problem, as Selin acquired four levels of government approval to build a causeway to the location. The house’s southern exposure maximizes passive solar energy. Its podular design features a variety of room shapes, sizes and ceiling finishes, as well as multiple rooflines. Williams says a challenge was to how to bring all the rooflines together, but tying them together under a cupola solved the problem. The home’s timber, meanwhile, was cut at the Normerica plant and shipped for on-site assembly. Blending communal and private spaces and areas that can be shut off from the rest of the house when not in use, the cottage is accessible for anyone with special needs and is designed for multi-generational living. The timber-frame materials were supplied by Sustainable Forest Initiative members. Its pre-fabricated walls and roofs drastically reduced the amount of on-site waste, while high insulation levels and low E argon windows help make the residence energy efficient. The limestone-coated steel roof looks like asphalt shingles but will last a lifetime and the pre-painted board and batten siding won’t need repainting for two decades. The home’s extensive decking is metal, topped with natural stone. Heating and air conditioning are provided by a geothermal system that uses in-lake air exchangers to draw heat from the North Channel in winter or expel it in summer. The cottage also has a Daikin Variable Refrigerant Volume system (usually found in commercial buildings) that has 13 different units inside the house and can move heat around where it’s needed through lines about the same diameter as a finger and requires no ductwork (ideal for a timber frame home). An 8×10-foot wall of ‘switchable’ glass in the second-floor office overlooks the living space below. With a flick of a switch, an LCD filament between two panes turns the glass from clear to opaque to provide privacy. The home’s Lutron lighting system is also state-of-the-art and networks all switches together in a programmable format. All the house’s systems can be monitored remotely through the Metasys Building Automation system. Craig Marshall’s company, Marshall Homes, usually builds custom and subdivision homes in Durham Region, but his company made a foray into cottage consruction after requests from three customers who had purchased homes from him. While Marshall hadn’t built cottages, he was already building in cottage country with Port 32, an active adult community in Bobcaygeon. 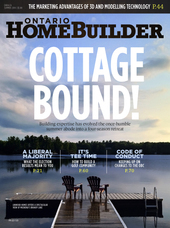 Marshall turned to architect Stephen Hunt, who does most of Marshall Homes’ design work, for further assistance on the creative front and ended up building Hunt’s own cottage on Crystal Lake near Kinmount. That four-bedroom 3,000-square-foot abode is on a point and is designed to take advantage of the views through expansive windows. The open-concept layout features dramatic pine cathedral ceilings to provide an even greater sense of space. The cottage was also designed to make use of the sloping lot to create a walkout basement. The 1,700-square-foot cottage that Kawartha Lakes Construction is building for clients on Catchacoma Lake in the Kawartha Highlands is a real cliffhanger. A staggered two-level design was the best solution for the steep bedrock site 70 feet from the water, says Scott Wootton, president of Kawartha Lakes Construction. The upper level has four bedrooms and the lower level features a kitchen, open-concept great room and dining room, with a large deck facing the water. A utility building sits beneath the upper level, housing the water filtration system and hot water tank. The clients are doctors from Timmins who grew up in the Kawarthas. Wootton used 3D renderings to explain the design to them and they embraced it. For most of the year, the island site is reached by boat, but Wootton says wind and wave action make it difficult to move materials. So he and his crew waited until the lake froze to a depth able to accommodate vehicles and took the building materials across on trailers. On site, they built a marine railway to carry the materials up to the site. Construction started in early February 2014 during the unusually harsh winter and continued through March, when work stopped temporarily until the ice went out. The steel plan required an engineer’s approval, then the steel work was done by R & J Machine in Lakefield. To secure the steel foundation, holes were drilled into the bedrock and mounting plates installed. An acrylic epoxy helps keep bolts in place. 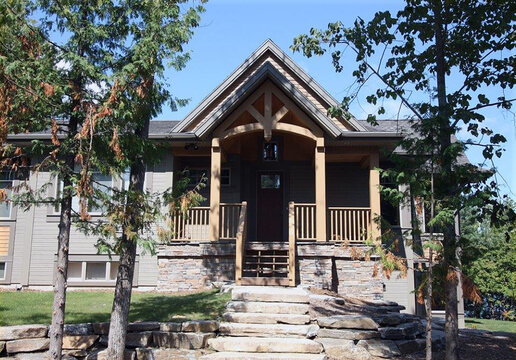 Wootton and his crew partnered with Discovery Dream Homes to create some timber frame elements for the cottage, while the conventional wood framing elsewhere helps keep costs down. The project was expected to be completed in July, just time for the owners to enjoy summer in their island abode.